We grow zucchini in our garden and, inevitably, we end up with more than we can use. One day, there may be two zucchini which are a bit too small to pick. The next thing you know, there are five the size of rolling pins! I often use the extra large zucchini for baking. While their extra moisture content may not be the best for general cooking, it is perfect for baking. 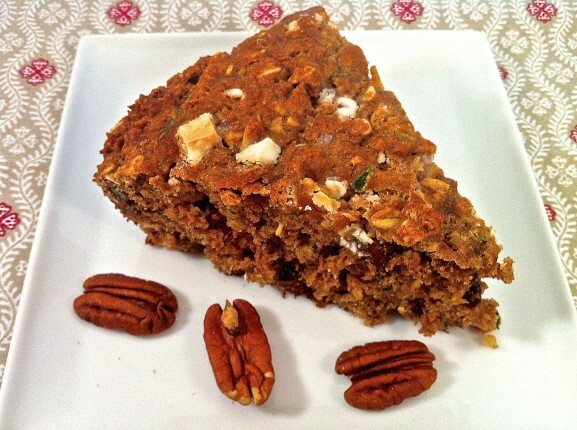 This recipe is one of two zucchini bread recipes I have been making for years. Over the years, however, I have adapted this recipe to make it healthier without sacrificing taste. This time around, I figured it was healthy enough to slide backwards just a bit. Although zucchini breads often have dark or milk chocolate mixed in, I thought the flavor of white chocolate would be pleasing. An added note: Though I added chocolate, I decreased the amount of sugar proportionately. So, I think we can call it an even trade! Typically, I cook this bread in a loaf pan, but the addition of the white chocolate made me think it would be fun to present it as a cake. Chopping some of the chocolate finely or coarsely grating it will provide optimal flavor throughout. A half cup of chocolate is a very good amount. If you want the cake to be even more dessert-like, feel free to increase the amount by another quarter to half cup. 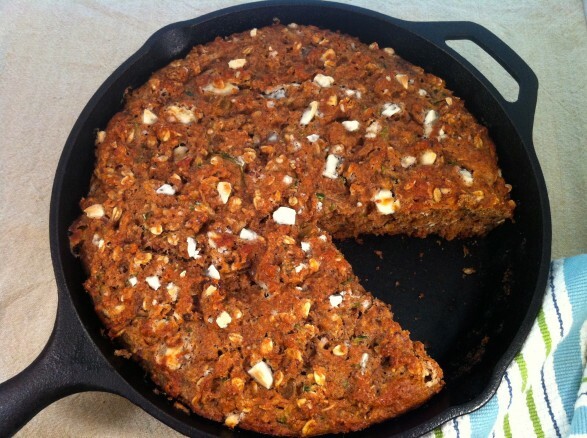 Preheat oven to 350 degrees and grease a 10″ cast iron skillet or a 9″x4″ loaf pan. Stir together all dry ingredients in large mixing bowl. Make a well in the center of the dry ingredients. Pour in the wet ingredients and mix until just incorporated. 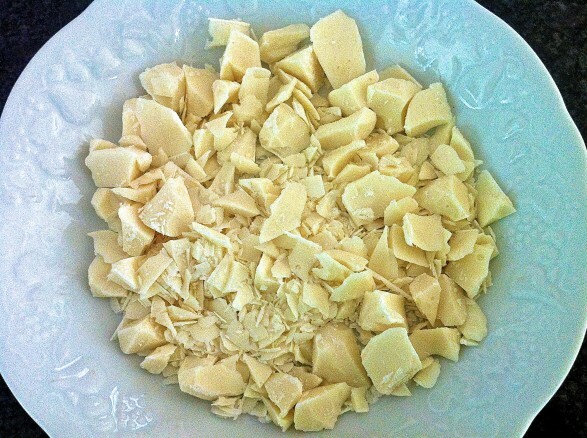 Transfer batter to the prepared pan and sprinkle with additional white chocolate, if desired. Until now, I have always made this quick bread without the white chocolate and have used 3/4 cups of sugar. Because I incorporated the chocolate, some of it finely chopped, it occurred to me that I could reduce the amount of granulated sugar. I was very happy with the 1/4 cup of sugar. If you forgo the chocolate, you may wish to increase the sugar to 3/4 of a cup. The batter will be thick. If the mixture seems too dry when incorporating the dry and the wet ingredients, simply add an additional quarter cup of buttermilk. Some zucchinis will produce more moisture than others and banana sizes vary. Sometimes, I need the extra amount of buttermilk at the end, sometimes I don’t. Always happy to share with you, Linda: ) I hope you enjoy!! Ann, holy smokes, this bread looks amazing! I can just taste all the yummy flavors together, what a great combination! I have never made skillet bread before but I will have to give it a shot now!!! Made this today !!! smells delious !!! Baked some in mini tins for our coffee station at church tomorrow !!! Will wait for comments !!! Don’t think there will be negitive comments !! I doubled the recipe !!! I will make this again !!! This looks so tasty that I think I might try my hand at making it Gluten Free without loosing any of its goodness and taste. I love using my cast iron pots for both cooking and baking!! I love cast iron, too, Karen! Let me know how you make out with the gluten free adaptation. I have been successful with my basic all-purpose gluten free flour blend. The substitution is cup for cup and the recipe is listed under Kitchen Basics if you are interested! Thank you for the comment!